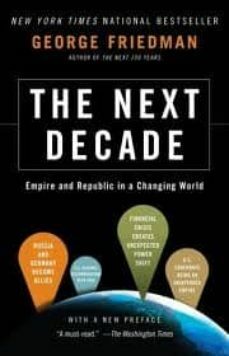 The new book is called The Next Decade. Titles notwithstanding, this book is very different from its predecessor, The Next 100 Years. The last book was about a century, a time frame in which all things are impersonal. A decade is the opposite, because it is filled with individual decisions and uncertainty. It not only requires a very different type of forecasting, it requires the opposite sensibility. In a century, leadership counts for little. In a decade, it counts for a great deal. The book is framed by two concepts. The first is the idea that the United States is an unintended empire of vast power, deeply interlocked with the affairs of most of the world. It is not a question of whether Americans want this empire; it is impossible to let go. The question is what to do with it. Like a child you did not expect and may not have welcomed, it is still your responsibility. The second concept is what I call the Machiavellian Presidency. I consider three presidents exemplary: Lincoln, Franklin Roosevelt and Reagan. Each possessed a deep moral core. Each fully understood the uses of power, lying and violating the Constitution and human rights to achieve the respective moral necessities of the abolition of slavery, the destruction of Nazi Germany and Imperial Japan, and the destruction of the Soviet Union. When we recall that Roosevelt allied with Stalin to defeat Hitler, we capture the Machiavellian President. The United States has stumbled into empire. It now faces the crisis of Rome that the empire will annihilate the republic. I argue that of all the institutions of our Constitution, it is the president who can preserve the republic while managing the empire. I also argue that the greatest threat to the republic is living in denial about what the United States has become. The issue, then, is how to manage the unintended and unwanted in the next decade.